Used Vauxhall Ampera Review - 2012-2015 | What Car? What's the used Vauxhall Ampera hatchback like? Opinions on future methods of propulsion for the private car are much divided, but undoubtedly one of the better and so far more overlooked ideas is that of the range-extender electric vehicle. Here, an on-board engine is used to charge up the electric motor that primarily drives the car’s wheels. The problems of range anxiety that beset a normal pure electric car are thereby nullified by always having an engine available to top up the battery charge if needed. 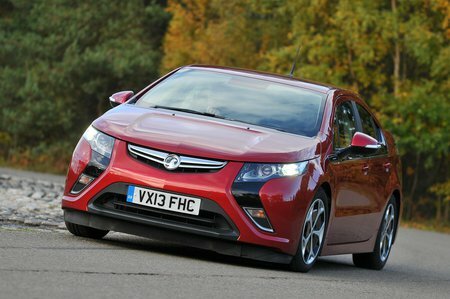 From this premise was born the Vauxhall Ampera, and its near-identical sibling the Chevrolet Volt, in 2012. Both cars were four-seat hatchbacks powered by lithium-ion batteries that could be recharged by plugging into the mains, or on the go by the aforementioned on-board 1.4-litre petrol engine. It won the European Car of the Year Award in 2012. Vauxhall claimed the Ampera could travel up to 40 miles on electric power alone, before the engine’s power was needed, although in our experience this tends to be more realistically around 20-30 miles. It makes for swift and hushed progress, and the smooth power of the electric motor does a good job of disguising some of the car’s predictable weight. On motorways the engine kicks in to join the electric motor, but it’s still a very refined place to be. It’s a reasonably enjoyable car to drive, too, with quick responses, pleasant steering and secure handling. 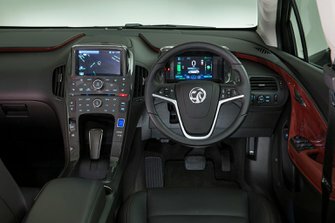 The driving position is spot-on and the interior, especially the dashboard, is eye-catching and futuristic. Alas its high purchase price might have put many potential purchasers off, and the Ampera was eventually dropped in 2015. Now, though, it appears to be rather an attractive used car proposition. After all you’re getting a lot of really quite good car and a lot of modern tech, without any of the usual electric car constraints over how far you can drive the thing.